#30. 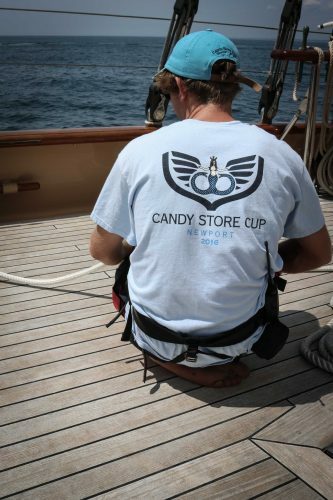 Candystore Cup – Sampson Boat Co. 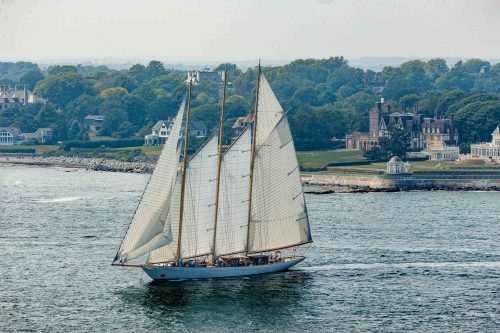 The area around Newport, Rhode Island is steeped in sailing history. In the 18th century whaling fleets sailed out of Nantucket, 60 miles to the east, navigating treacherous sandbanks and frequent fog to reach the open waters where they could hunt their enormous prey. 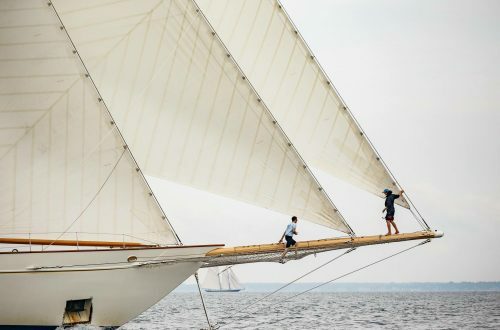 Much later, Newport itself was home to the famous America’s Cup from 1930 to 1983, where the iconic J-class yachts, and later the 12-metre class, battled each other over the world’s oldest international sporting trophy. The area is renowned for its changeable weather and fickle wind. A local saying observes; “if you don’t like the weather in New England – wait five minutes”. When the sun does shine the coastline is breathtakingly rugged, with temperate greenery that invokes images of a rural Scotland on an unusually warm day. Tourists travel to Newport from miles around to cruise the Ocean Drive and admire the multi-million dollar mansions that line the shore. On this particular summers day in 2016, however, the sky was thick and grey, and the drizzle fell relentlessly. A light but sharp Northerly breeze whispered over the bay, and chilly spectators peered out towards the gloomy sea from the beaches. They waited and watched until all of a sudden their patience and endurance was rewarded. Out of the murk appeared some of the largest and most impressive sailing yachts in the world, ghosting downwind past Castle Hill and out of Narraganset Bay, with their enormous spinnakers flying out before them. 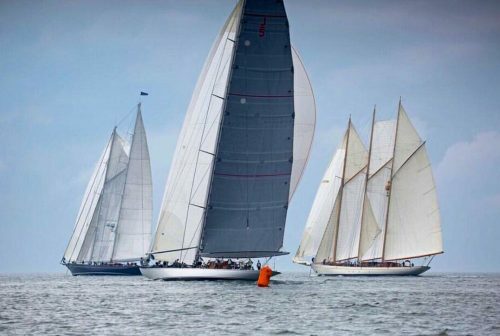 The boats were crossing the starting line in the first race of the inaugural Candy Store cup – the latest embodiment of a regatta that started thirty years ago, when a wealthy but eccentric publisher, Nelson Doubleday, stood on a milk crate in a small harbour in Nantucket and announced that he was sick of the pretentious and regulatory sailing events of the time. 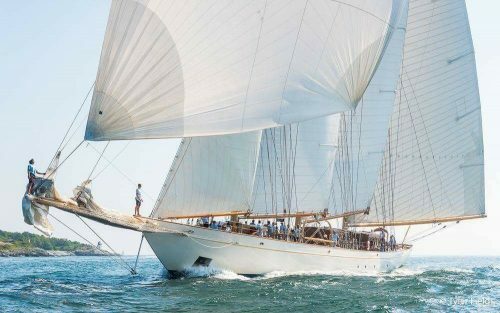 With help from three yacht captains he put together the Nantucket Bucket, a race that welcomed large yachts regardless of class or division. The principle was to have fun – five dollar toys were awarded as trophies, and the committee had to be bribed with bottles of chilled champagne to consider protests. 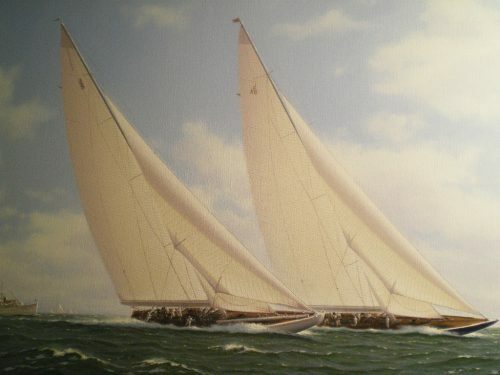 His regatta was a great success amongst like minded-sailors and it increased in size every summer, until fifteen years and one liver transplant later, Doubleday threw in the towel and the bucket left Nantucket, for Newport. By this time, the St.Barths Bucket had also been started, which subsequently became a much bigger event than Newport, incorporating larger sponsors and many more yachts. When the organisers of the Bucket decided that they wanted to focus all their efforts on the Caribbean in 2015, two Newport businessmen jumped at the chance to try and rejuvenate the original spirit of the regatta. Charlie Dana, owner of the Newport Shipyard that hosted the bucket for years, teamed up with David Ray, the owner of Bannisters Wharf (part of the Newport waterfront, which incorporates the “Candy Store” – a dockside bar that marked the end of the course for an informal race that used to take place on the lay day of the America’s Cup, as far back as 1977, known affectionately then as the “The Candy Store Cup”). 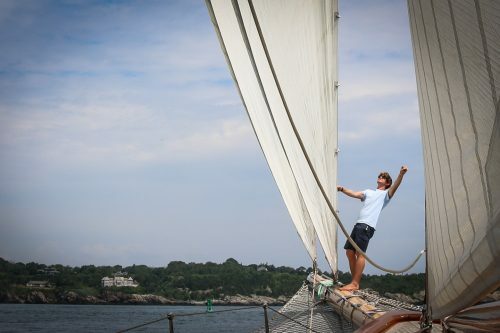 Together they took ownership of the Newport Bucket and in July this year, with its new name revived from past glory, the event was hosted once again at Newport Shipyard. 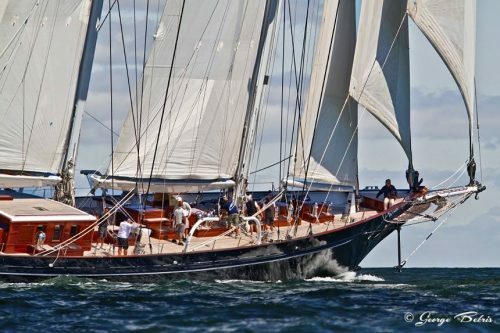 The magnificent J-class Ranger won the class A race on that first rainy day, while the 92’ yawl Bequia took first place in class B. Both boats had consistently impressive starts over the whole weekend, crossing the line less than 10 seconds after their start time every day. 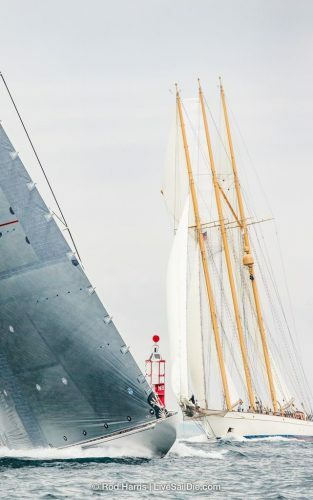 I was sailing on the three-masted Schooner Adix, and we had an exciting finish, only just beating the Perini Navi Zenji over the line. On the morning of the second day, there were many furrowed brows, as skippers and tacticians tried to interpret an equivocal forecast. The prediction was for very little or no wind, but the consensus among the experts was that anything could happen, and we all hoped that the skies would stay clear and the hot sun would whip up a southerly sea breeze in the afternoon. The start was postponed and all over the dock, on decks that were prepped and ready to race, crews gazed up at their courtesy flags, hoping to see a ripple in the stars and stripes that could herald a day of racing ahead. Just in time, the sea breeze filled in, and with sighs of relief we all slipped our lines and headed out past Castle Hill. 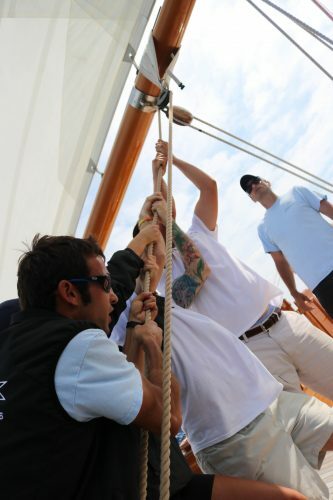 On Adix, we had nearly fifty crew on board, and although most of them didn’t know the boat, the regular crew took a team to each mast and showed them the ropes. As we circled the start line, all of our working sails went up – with the topsails and smaller (relatively!) headsails being sweated up by hand. 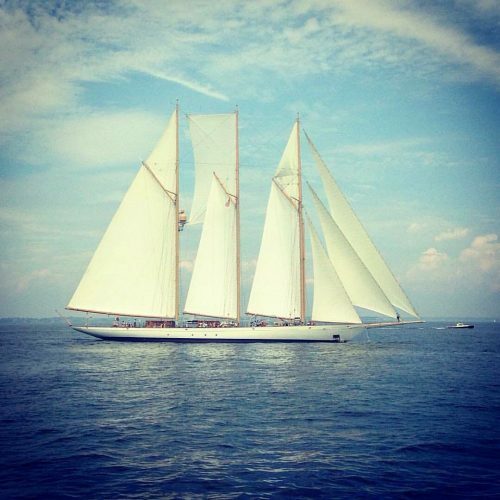 We had the third start of the A class, after the 43m grand banks fishing schooner replica Columbia. As a larger boat, we tend to be faster on the water than them, but we have noticed that since we raced them for the first time in Antigua, it has taken us longer each time to overtake, as their crew get to know their relatively new schooner. 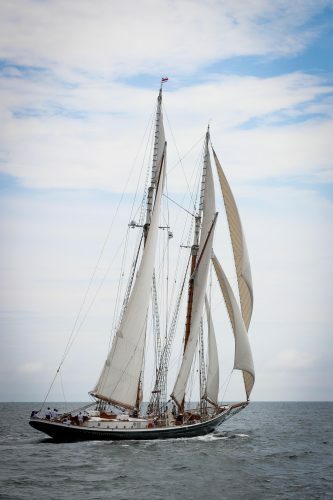 As we passed them on Saturday, we admired their beautiful traditional rig and elegant sheer. Columbia is one of the most photogenic boats around at the moment, and is run by a lively, first-rate crew. Being completely traditionally rigged, she doesn’t carry a spinnaker, and she suffered for it on the downwind leg after the first mark, as all the other boats hoisted their kites for a bear-away set. 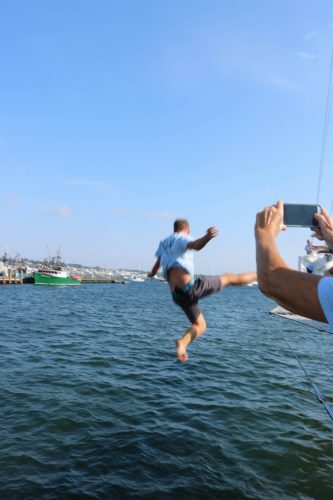 Rumour has it that the owner may be reconsidering his sentiments on downwind headsails for next year. The downwind mark was close to shore, and we had an exciting kite drop on Adix – I spiked the tack from the end of the bowsprit and the crew hauled in 380m2 of sail, covering themselves and the entire foredeck, just in time for us to come around the mark and trim in for the beat towards the next mark, which was the other side of a lee-shore headland. 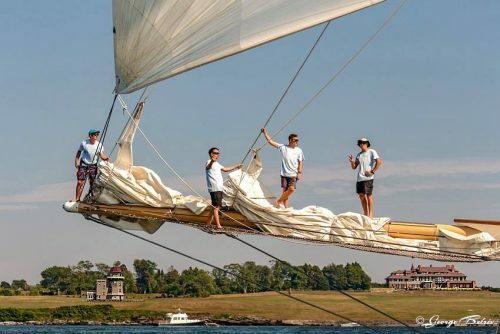 After a lively beat through fields of lobster pots, we rounded the next mark and hoisted the kite again, gybed it off Beavertail Point, and hurtled through the finish line off Castle Hill with eight sails drawing the little wind that we had. 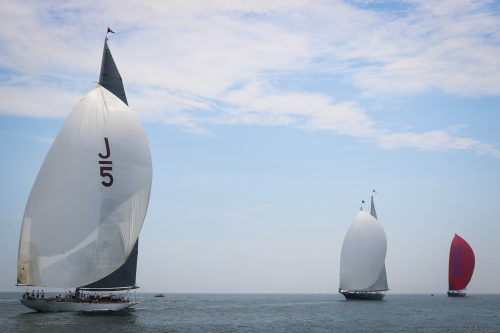 We fired our cannons at the crowd and kept our spinnaker up, carrying a total of 1500m2 of sail right up into the mouth of Newport Harbour, between rafts of motorboats anchored for the Newport jazz festival. We fired off a few more cannon rounds at Norah Jones (who didn’t miss a beat, to her credit) and finally rounded up just in front of Goat Island to douse all of our canvas. 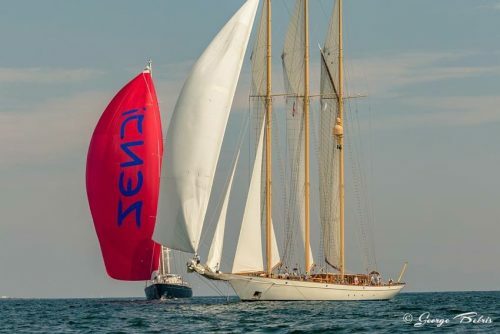 Bequia won B class again on Saturday, and we clinched first place in Class A, putting us in an overall tie with Meteor, the elegant 52m Royal Huisman Schooner that surprised us all with her sheer speed and power in light airs. That night, Meteor’s owner invited the entire regatta up to his house on Ocean Drive for a spectacular party in an enormous marquee overlooking the Atlantic. Amazingly, the original deckhouse from the J-class Shamrock V mysteriously appeared on the lawn, complete with a gentleman in a tuxedo who proffered whisky and cigars to puzzled passers by. As the evening progressed, crews and owners mingled, and there was much dancing and buffoonery. One anonymous crew member was overheard asking at the bar for a “Zenji on the rocks”, in reference to an unfortunate incident earlier in the day, only to be sharply informed that he was standing next to that yacht’s navigator. The whole ordeal was outstandingly amiable, and not a single member of the race committee left the party on crutches. The wind on the final day of racing was equally light, but this time out of the East. The course started with a reach to the first mark and then a beat to windward. As promised the night before, Columbia managed to hold the lead over us on Adix until we had passed the first mark (but only just!). At the second mark we tacked into a kite drop – at unusual maneuver that was made all the more difficult by the fact that we have to drop and re-hoist two of our topsails on each tack anyway, and this time we also hoisted the spinnaker and the fisherman, and dropped our outer and inner jibs. We had enough hands for the operation to go well, and had a good run down with Zenji and Ranger before spiking the kite during the gybe and reversing the other sail changes for the long reach back to the finish. 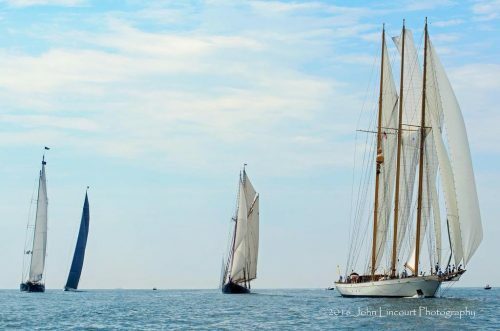 On that third day, Adix took first place again, meaning that the three-masted Schooner finished first in Class A overall, followed closely by Meteor, Ranger, Columbia, Zenji, and Sunleigh. 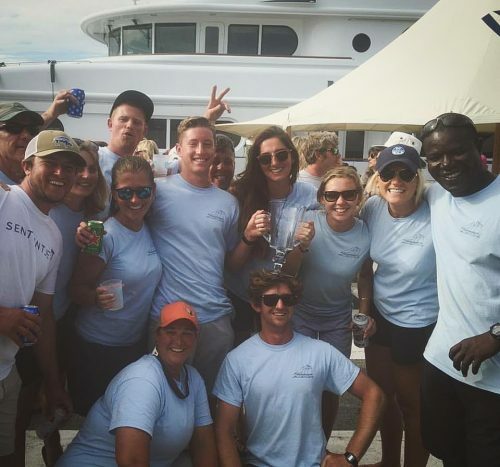 In Class B the beautiful local sloop Wild Horses took first place on Sunday, but finished second overall, while the adeptly sailed 28m yawl Bequia won her class, as well as the Overall Candy Store Cup for having the lowest point score of the regatta. Sirona came third in Class B overall, followed by Sejaa, Sapphire III, and Audrey II. After the relaxed prize-giving, the party continued with typical debauchery on the dock. The atmosphere was convivial and full of camaraderie, and I think that everybody present understood that you cannot take winning or losing too seriously in an event like this, with boats so wildly different in design, size and performance. Eventually, some of the crews made their way to the Candy Store itself, where the roots of this event were born many years ago. As we left the yard, two men in a car were spotted donning a ski mask and an inflatable alligator to make an evening raid on Columbia. For me, this summed up the spirit of a cheerful and light-hearted regatta, although we never did find out if their mischief was successful. Photo credits; Rod Harris, George Bekris, John Lincourt, Tijana Stojanovic. Apologies if I haven’t credited your photo, if so please get in touch.